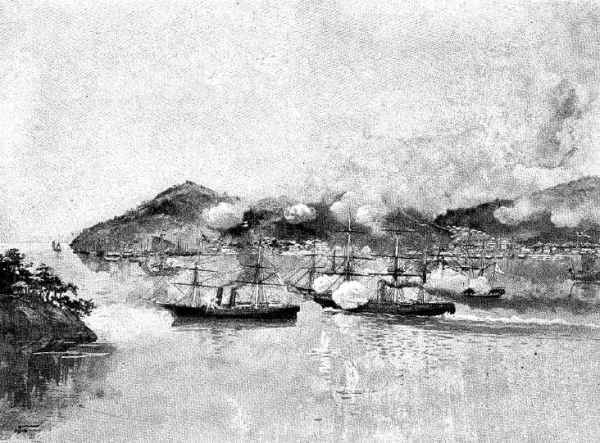 1867 A US naval force raids Formosa in reprisal for the murder of a crew of shipwrecked American sailors. 1884 Birth: Anton Drexler: Co-founder (with Gottfried Feder and Dietrich Eckart) of the "German Workers Party" (DAP), which will become the Nazi party. 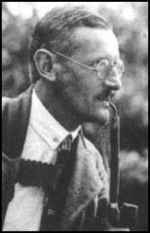 Anton Drexler was born in Germany on 13th June, 1884. He worked as a machine-fitter before becoming a locksmith in Berlin in 1902. A fervent nationalist Drexler was upset when he was rejected as unfit to serve in the German Army during the First World War. In 1919 Drexler joined with Gottfried Feder and Dietrich Eckart to form the German Workers' Party in Munich. Adolf Hitler joined the party soon afterwards. He was only the fifty-fourth person to join the party. Hitler was immediately asked to join the executive committee and was later appointed the party's propaganda manager . . . . Adolf Hitler was often the main speaker and it was during this period that he developed the techniques that made him into such a persuasive orator. Hitler successfully persuaded Drexler that the GWP should change its name to the National Socialist German Workers Party (NSDAP). In February 1920, Hitler and Drexler published its first programme which became known as the "25 Points." 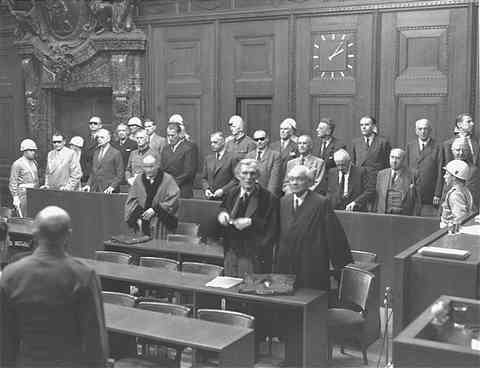 In the programme the party refused to accept the terms of the Versailles Treaty and called for the reunification of all German people. To reinforce their ideas on nationalism, equal rights were only to be given to German citizens. "Foreigners" and "aliens" would be denied these rights. To appeal to the working class and socialists, the programme included several measures that would redistribute income and war profits, profit-sharing in large industries, nationalization of trusts, increases in old-age pensions and free education. The programme was also reflected the racist views shared by Drexler and Adolf Hitler. It appealed to the Anti-Semitism that existed in Germany at that time by stating that "Citizenship is to be determined by race; no Jew to be a German. On 24th February, 1920, the NSDAP, later nicknamed the Nazi Party [by outsiders], held a mass rally where it announced its new programme. The rally was attended by over 2,000 people, a great improvement on the 25 people who were at Hitler's first party meeting. Hitler knew that the growth in the party was mainly due to his skills as an orator and in the autumn of 1921 he challenged Drexler for the leadership of the party. After brief resistance Drexler accepted the inevitable, and Hitler became the new leader of the Nazi Party. Anton Drexler left the NSDAP in 1923 and was a forgotten figure by the time he died in Munich on 24th February, 1942. 1887 Birth: Bruno Frank: German author. 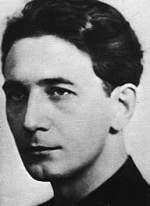 Frank studied law and philosophy in Munich where he later worked as a dramatist and novelist until the Reichstag fire in 1933. Fearing the new government because of his Jewish heritage, he left Nazi Germany with his wife Liesl and lived for four years in Austria and England, then in 1937 finally went to the USA where he was reunited with his friend Thomas Mann and worked for the film industry for the rest of his life. 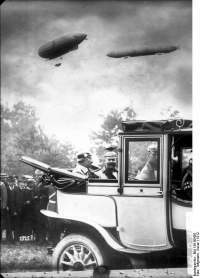 Kaiser Wilhelm II of Germany leaves Konopischt, Bohemia (today the Czech Republic), the hunting lodge and country estate of Archduke Franz Ferdinand of Austria-Hungary, after a weekend visit. Although Wilhelm had ostensibly come to admire the lavish gardens at Konopischt, the reality was that he and Franz Ferdinand wanted to discuss Austria-Hungary's insecurities about the tenuous balance of power in the tumultuous Balkan region. In 1908, the Dual Monarchy of Austria-Hungary had annexed Bosnia-Herzegovina, formally still a province of the Ottoman Empire, and populated not only by Bosnians but also by Croats and Serbs. Serbia reacted angrily to the annexation, reasoning that if Bosnia were not under Turkish rule, it should be governed by Serbia. After two successful Balkan Wars—and enjoying support from the Russian empire, the other great European power in the region apart from Austria-Hungary—Serbia had emerged as a more powerful and ambitious nation than ever before, thus threatening the position of the Dual Monarchy, already in decline. Though the Austrian government preferred Bulgaria, Serbia's opponent in the Second Balkan War of 1913, Franz Ferdinand, along with the Germans, favored Romania, despite the latter country's clash with the Magyars (Hungary's majority population) over their oppressive rule in Transylvania, ethnically Romanian but part of Hungary. Franz Ferdinand detested the Magyars, and resented the weakness that forced Austria to partner with Hungary in government of the empire. 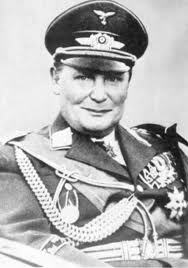 Wilhelm was more inclined to negotiate with the Hungarian prime minister, Istvan Tisza; at Konopischt, he and Franz Ferdinand discussed the possibility of persuading Tisza to look more favorably on an alliance with Romania. The meeting of June 12-13, 1914, at Konopischt was not, by any means, a war council. Both Wilhelm and Franz Ferdinand—though anxious over the situation in the Balkans and fearful of Serbian and Russian aggression—had up to that point been voices of restraint among their more belligerent colleagues in the government and military of the two nations. Some historians have argued that if the two men had continued to work together to pursue their common aims, the Great War of 1914 might never have happened. Two weeks later, however, on June 28, Franz Ferdinand and his wife Sophie were killed by a young Serbian nationalist during a diplomatic visit to Bosnia. Vienna, along with most of the world's capitals, blamed Serbia. Kaiser Wilhelm was stunned, saddened and outraged. Barely a month later, Europe was at war. Bombing: Fourteen German Gotha bombers carry out the first large-scale bombing raid by planes on London, killing 162. The only previous aerial bombs were dropped by zeppelins. Was there any other alternative for us than to declare war? I would like to begin with the fundamentals. That depends upon what in fact and in law the act of Germany was. What was the law? It is what is called international law; that is, a rule of conduct adopted by the acquiescence of all nations, of one nation toward another, both in peace and in war. The branch of international law in which we are concerned here is perhaps the most definitely fixed of any branch of that jurisprudence, which in some respects is indefinite. It is the branch that governs the capture of commercial vessels at sea. For a hundred years there has been very little doubt about the rules. 1932 Weimar: SA and SS: Bavaria and Wurttemberg object to the proposed removal of the ban. See April 14. 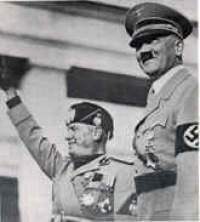 This first meeting between Hitler and Mussolini took place in Italy . . . in Venice in mid-June 1934. The aim of the meeting was the distribution of interest spheres between the two fascist countries. The meeting, however, was cold and unpleasant from the start. Dressed in a ceremonious general's uniform, Benito greeted Adolf pompously and standoffishly. Because he received the wrong instructions from his ambassador in Rome, Hitler arrived in a plain raincoat and looked very modest alongside the dressed-up Mussolini, which made him feel uncomfortable. 1936 Palestine: Britain is forced to declare martial law. 1937 Switzerland: Communist Party banned by the state of Geneva. USA: President Roosevelt subverts the US Neutrality Laws by having shipments of artillery and arms sold to a steel company and then re-sold to the British government. The first shipment leaves the US on the SS Eastern Prince. War at Sea: The British auxiliary cruiser Scotstown is sunk by U-25off the Irish coast while the German raider Orion lays mines off Auckland, New Zealand. Romania: Horia Sima is liberated and granted an audience with King Carol. France: Prime Minister Reynaud once again appeals to Roosevelt to intervene, again without success. German troops reach the northern outskirts of Paris which has been declared an 'open city'. War in the Air: Italian bombers attack the French naval base at Toulon. Owing to the simultaneous purchases of goods by the different branches of the Wehrmacht and other organizations on the so-called black market, a situation has developed in some occupied territories which hampers the methodical exploitation of these countries for the needs of German war economy, is also harmful to German prestige, and endangers the discipline necessary in the military and civilian administration. This deplorable state of things can no longer be tolerated. I therefore charge you to regularize these commercial transactions in agreement with the services that are involved and, particularly, with the chiefs of the administration of the occupied territories. In principle, commercial transactions in the occupied territories that are made outside the framework of the normal provisioning, or constituting a violation of price regulations, must be limited to special cases and can be carried out only with your previously given assent. I approve your proposal that only to trading companies controlled by the Reich should be assigned the handling of these goods, in the first place the 'Roges.' I beg you to submit, at the earliest possible date, a detailed plan of operation for starting your activity in Holland, Belgium, France, and Serbia. (In Serbia it is Consul General Neuhausen who is to be in charge.) This plan must include the seizure of port installations and machinery and tools of enterprises to be closed down in the occupied territories. As to the results of your work, I beg you to submit a report to me every month through my representative; the first to be sent on 1 July 1942. If necessary, the Central Planning Board will decide as to the distribution of merchandise thus purchased. USA: President Roosevelt creates the Office of War Information, a center for production of propaganda, and appoints news commentator Elmer Davis to head it. North Africa: In the battle for Tobruk, German tanks and anti-tank batteries of the Afrikakorps destroy 138 enemy tanks, leaving the British Eighth Army with only 75 operational armored vehicles. Wunderwaffen: Germany launches 10 of its new V1 rockets against Britain from a position near the Channel coast. They prove to be less than devastating. This was certainly the case against Britain. Of the 10 V1, or Reprisal 1, "flying bombs" shot at England, five crashed near the launch site, and one was lost altogether—just four landed inside the target country. Only one managed to take any lives: Six people were killed in London. 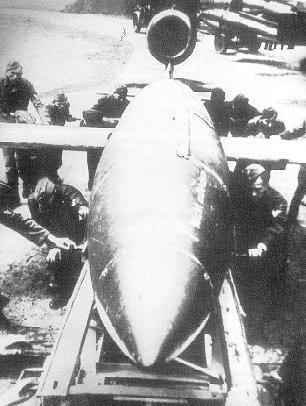 The Germans had hoped to also mount a more conventional bombing raid against Britain at the same time the V1s were hitting their targets—in the interest of heightening the "terror" effect. This too blew up in their faces, as the Brits destroyed the German bombers on the ground the day before as part of a raid on German airfields. With the return of daylight on 13 June six companies occupied the lower end of Kunishi Ridge, and none of them could move. All were dependent upon tanks for supplies and evacuation. Twenty-nine planes dropped supplies, but with only partial success since a portion of the drops fell beyond reach and was unrecoverable. One hundred and forty men from the two battalions were casualties on 13 June; the seriously wounded were returned in tanks, men with light wounds stayed on the ridge, and the bodies of the dead were gathered near the base of the ridge. The burden of offensive action fell upon the tanks on 13 June and the three days following. Flame and medium tanks moving out on firing missions carried supplies and reinforcements forward and then, on the return trip for more fuel or ammunition, carried wounded men to the rear. Soft rice paddies made it necessary for the tanks to stay on the one good road in the sector, and this road was effectively covered by Japanese 47-mm. shells and other artillery, which destroyed or damaged a total of twenty-one tanks during the five day battle. DR. STEINBAUER: Now I pass over to the next chapter, and that is the combating of so-called enemies of the State. Yesterday it was mentioned that the property of the Freemasons and Jehovah's Witnesses was confiscated. I should like to ask you, so that there may be no mistake, whether it was only the property of the organizations which was claimed, or was it also the property of the individual members? And so, taking the Freemasons as an example, was the property of the individual Freemason claimed as well as the property of the lodges? WIMMER: In all these cases property that belonged to organizations was demanded, never that belonging to individuals. If there were individual cases where this happened, then these were abuses by individuals, but I cannot recall any such abuses. DR. STEINBAUER: The Dutch Jews were also counted among the so-called enemies of the State. Who was responsible for handling the Jewish question in the Netherlands-you have really already told me that. WIMMER: From the very beginning, the Police laid claim to the handling of the Jews, to jurisdiction over the treatment of the Jews, as a matter of fundamental principle. DR. STEINBAUER: Now, we have an entire list of decrees here which bear the name of Seyss-Inquart and which indicate encroachments on the right of the Jews. Can you remember when the legislation against the Jews was introduced and in what form? 1965 Death: Martin Buber: Austrian-Jewish philosopher, translator, and educator, whose work centered around theistic ideals of religious consciousness, interpersonal relations, and community. In 1930 Buber became an honorary professor at the University of Frankfurt am Main. He resigned in protest from his professorship immediately after Adolf Hitler came to power in 1933. On October 4, 1933 the Nazi authorities forbade him to lecture. He then founded the Central Office for Jewish Adult Education, which became an increasingly important body as the German government forbade Jews to attend public education. The Nazi administration increasingly obstructed this body. Finally, in 1938, Buber left Germany and settled in Jerusalem, Israel. Princess Stephanie von Hohenlohe (1891-1972) was an unofficial go-between at the highest level of international politics, conveying secret messages and setting up meetings involving Hitler, Goering, Lord Halifax, Lord Rothermere, the Duke and Duchess of Windsor and, later, US Presidents Kennedy and Johnson. Yet her origins were far from aristocratic. The illegitimate daughter of a Jewish woman from Prague and a Jewish moneylender, Stephanie always claimed to be of pure Aryan descent. A shameless social climber, she had a child by the Emperor's son-in-law and acquired her title by marriage to another Austro-Hungarian prince. Employed by Lord Rothermere, her most important assignment was to bring Rothermere and Adolf Hitler together. Hitler awarded her the Gold Medal of the Nazi Party, a unique honor for any woman, let alone one generally known to be Jewish. Divorced since 1920, Stephanie had conducted a string of affaires with rich and influential men. In 1937 she began an intense relationship with Fritz Wiedemann, Hitler's adjutant. When Hitler learned of this he dispatched Wiedemann to the post of Consul-General in San Francisco, where Stephanie joined him in 1939. In 1941, she managed to avoid being deported as a spy by seducing the head of the US immigration authority. After the war, Stephanie began a completely new career as a journalist for several publications including Axel Springer's Stern magazine, for whom she secured the Kennedy and Johnson interviews. 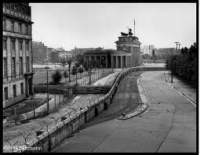 1990 East Germany begins the final demolition of the Berlin Wall, knocking out concrete slabs all over the city to reopen streets sealed off since the Cold War barrier was built in 1961.